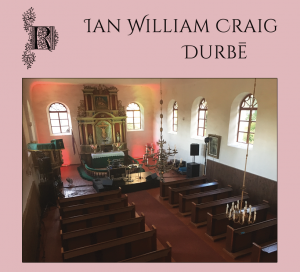 Brainwashed - Ian William Craig, "Durbē"
"Ian shared this live performance with me in January of 2017, while I was living in London for work. I fell asleep countless times whilst listening to this, day and night. After some arm twisting Ian agreed to let me publish it. He had not planned on releasing it officially. Durbē embodies the most elegant and meditative aspects of Ian's music. Live, Ian's music is able to stretch and fold and soak. These long-form takes show how purely structure and melody rotate within him. In the fall of 2016, Ian performed these recordings in a 14th-century Latvian church. This environment kissed Ian's cheek that evening, and he sang in top form, ascending into the rafters."